Load up this sturdy, handsome grocery tote from Stars and Stripes — and never again have to use plastic or paper! Tired of bags ripping before you're even out of grocery store? 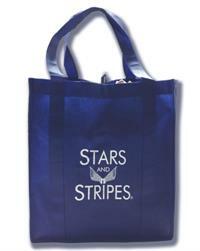 This grocery tote from Stars and Stripes could be the ideal solution. This 80g non-woven polypropylene grocery tote lends Herculean strength to those weekly forays into the grocery aisles. Sports a pair of hefty 20" double reinforced handles, an extra-large 10" gusset, and a PE board bottom to stand up to large loads. Makes a wonderful reusable alternative to in-store packaging and fits more too! 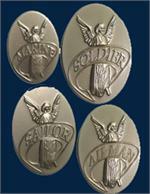 Size: 14-1/2" x 13" x 10".